SPF Show me your piggies! Edit to add: I think this just may be grossing folks out, because I’ve had a lot of hits but nobody seems to be saying anything!!! So if you have a weak tummy…scroll away from the feet!!!! Personally, I think Kristine is still flying high from with wedding bliss because the only thing she wants to see this week is our feet! Yuck! I think feet are one of the ugliest parts of the human body. Are you ready for this? Take a deep breath! Shaun always calls me “Monkey Toes” because I can and often do all sorts of things with my stubby little toes. I didn’t really paint with them, but I could’ve. 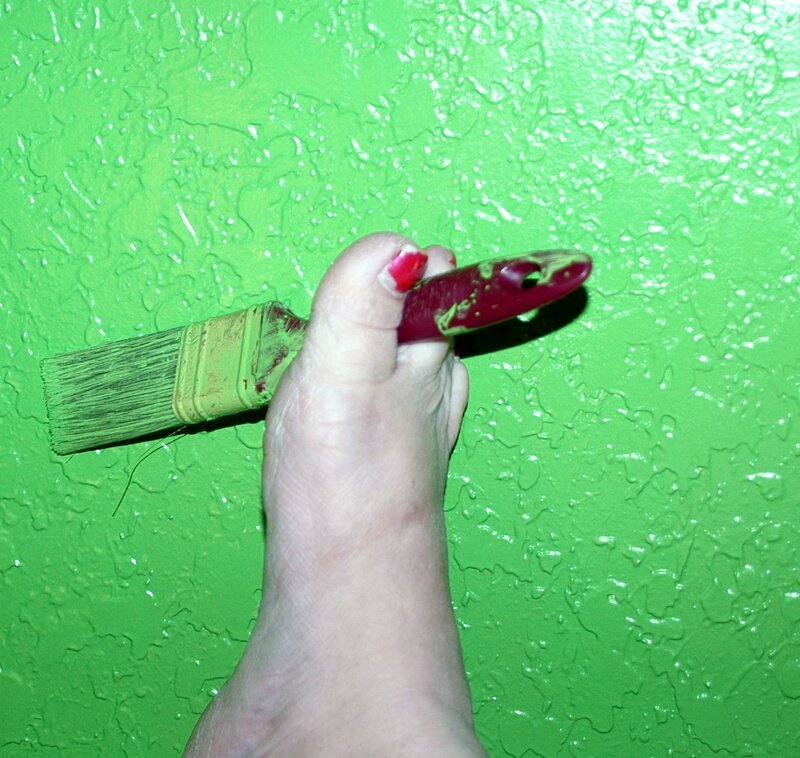 Bonus shot: The night before Mimi left she gave me a pedicure…of sorts. She loves getting flowers painted on her fingers and toes at the shop, so she treated me to her very own, highly unique version. Those pink and gold globs are two (or perhaps three) flowers. I told her I would leave them on until she came back. It’s been nearly three weeks. As ragged as my tooties look, they still make me smile whenever I glance at them. 14 Responses to SPF Show me your piggies! Interesting. What do you charge for parties? You got creative, even with feet. I’m with you- I think feet are horrible! You can paint with your feet? Oh my god at the things I could get accomplished if my feet would only cooperate. Great macro of the toe — lots of talent in general showing in this post. 😉 Happy SPF! hysterical…nice shade of green though! And to think we had professional painters come in a couple months ago and paint our place … where were you when we needed you??!! WooHoo! Talent AND cute polish – I’m glad I stopped by!